The theme of Come Redeemer is prophecy. In 2003 I remember reading Jesus’ words in Matthew 24 about his second coming: “The sun will be darkened, and the moon will not give its light”, and I thought, what an aweinspiring prophecy this was! I promptly wrote a melody for those few verses, and that planted the seed in my mind — to write a longer work which would include other prophecies about the coming of Jesus. Most people think of the coming of Jesus as a Christmas theme, but as I searched the Scriptures I found prophecies about many other aspects of the appearance of the Messiah — his life, his role, his ministry, his teaching, his death, his resurrection, his ascension, his coming again in glory and his final judgement throne. 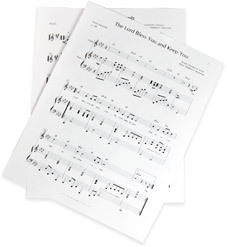 In fact the Scriptures are so rich in prophecy that it is hard to decide what to include in a musical work like this one. So the cantata has ended up being more of a random, rather than a methodical, selection of prophecies. The work is in two parts — the first dealing primarily with the first coming of Jesus, and the second dealing with his second coming. Contemporary cantatas do not necessarily fit the traditional model. Although I have set the words of Philipp Bliss’ old hymn Man of Sorrows to a new melody in Come Redeemer, and although this hymn has proved to be a pivotal reflection on the suffering of Jesus, the hymn itself, powerful though the words are, is not the theme in this cantata. 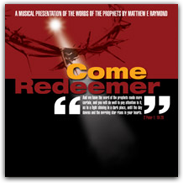 Come Redeemer was first performed in Auckland in May 2007, and was released on CD in 2008. All Scripture is taken, with permission, from the NIV. © 2012 Matthew Raymond – All Rights Reserved.